Creating the Change you want to see! 2017 – Tapping into your heart’s desires. What would it mean to you if you could get all the desires of your heart? Would you be able to contain it? How would you change? What would this do for you? I am almost sure that these are questions that no one really asks as they seek their heart’s desire. As humans, we have this strong desire to be fulfilled in life. Often, this desire is attached to acquiring our “pot of gold”. We have attached our desire to the physical things that benefits just us and how we want to feel. We love self-gratification and sadly people get lost at the top when they believe they have reached that level of self-actualization. I do not claim to be a psychologist, but I am fascinated by human behavior and the way we think. We have such a powerful engine called the brain that has stretched our reality. I am inspired by how one thought can revolutionize our entire human experience. We can only imagine today what went through the thoughts of greats such as Albert Einstein who developed the general theory of relativity and Steve Jobs who is considered the pioneer of the microcomputer revolution, or that of Elon Musk whose vision is to change the world and humanity by reducing global warming through sustainable energy production and consumption, and reducing the “risk of human extinction” by “making life multiplanetary”. While you and I have seen most of the results of Einstein and Jobs, Musk’s outlandish approach to what the world should be in the future may scare a lot of us. But, this is all pointing to what the human heart desires. Musk apparently has tapped deep into his heart’s desires as he wants to change the world in his lifetime. So too did Einstein and Jobs who removed some of the world’s frustrations by providing us groundbreaking discoveries to make life better for all. As I looked closely at these desires, it brought to light one fundamental question: To what end? There is no certainty that after we have tapped into our heart’s desire that we will be finally fulfilled because we are creatures of dominion and we try relentlessly to get to the next desire. But, to what end? This must be what Abraham Maslow must have thought about when he studied the greatest minds of his time. We normally read and see a depiction of Maslow’s hierarchy of needs as five levels throughout one’s development. These needs are aligned to our desires. Each level of realization brings about an awareness that provides a window into what we can or need next. 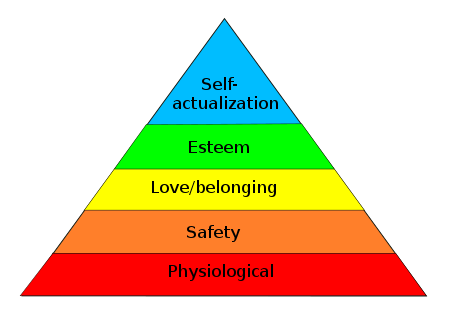 The highest level in this need that we have as humans based on the earlier version of Maslow’s study was self-actualization. Barry, author of the blog Personality & Spirituality provides the insight that Maslow thought self-actualization reflects the fact that human beings are not simply biological machines. As we mature and become more aware of ourselves, we are increasingly driven by a sense of personal meaning and purpose. The pictorial provides where we often stop when we talk about the hierarchy of needs. As Maslow searched deeper, he did find another level that puzzled him. He discovered that people who reach the highest level which he had originally thought were now aiming for something else. In his studies, he discovered what he called peaked experiences. Why do you want to live and do what you do? When do you feel most fulfilled? What makes you happy when everything else is falling apart around you? What is the one desire that you have that will change the world? #Keep Doing Your Best Work! 2017 – Challenge your F.E.A.R. !